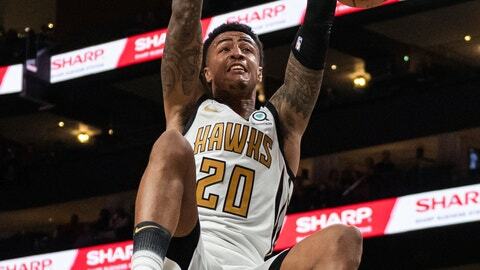 ATLANTA (AP) — John Collins was most pleased that Atlanta avenged a blowout loss to Denver. Collins scored a career-high 30 points, and Vince Carter and DeAndre’ Bembry came off the bench to fuel a third-quarter rally that helped the Hawks beat the Nuggets 106-98 on Saturday night. Collins thought back to a 138-93 loss to the Nuggets last month. Collins added 12 rebounds and five assists and played Denver center Nikola Jokic at least evenly although they were not always matched up. Jokic had 24 points, 11 rebounds and seven assists, but in closing a five-game trip with the final four games in the Eastern time zone, the injury-riddled Nuggets ran out of gas and faded while watching a 56-51 halftime lead vanish in Atlanta’s 35-21 third quarter. The Hawks (6-20) snapped a four-game losing streak. Denver (17-9) dropped games on back-to-back nights for the first time all season after sweeping the first three situations. The Nuggets fell 113-107 Friday in Charlotte. Juancho Hernangomez pitched in 17 points and 10 rebounds for Denver. The Nuggets were in charge most the first half, especially in the first quarter as Jokic scored 15 points, but rookie guard Trae Young scored on a driving lineup with 8:28 to go in the third quarter to give the Hawks a 61-60 lead. Atlanta built the margin to 84-72 on a driving layup by Bembry with 58 seconds left in the period. Carter scored 11 of his 13 points in the third, when Bembry added eight of his 18 and the Hawks took a 86-77 lead into the fourth quarter. Atlanta made 13-of-22 shots in the period, including 8-of-12 3-pointers. Atlanta had a 31-23 rebounding edge in the second half, and center Dewayne Dedmon grabbed 11 boards. Nuggets: It’s not hard to see how they lost. Denver shot just 29.4 percent in the second half while making 15-of-51 shots. . . . Mason Plumlee scored six points off the bench for the Nuggets, but missed the chance to play against his brother Miles, whose sore knee kept him out of action for the Hawks. Hawks: Played without backup G Jeremy Lin (lower back strain) and Fs Taurean Prince (left ankle sprain) and Omari Spellman (right hip). Denver went without starting forward Paul Millsap for the first time since he fractured his right big toe Friday at Charlotte, and guard Jamal Murray left the game when kicked in an already sore shin. Also, high-scoring guards Will Barton (right hip/core) and Gary Harris (right hip) remained sideline for Denver. The Hawks had 33 assists, one short of their season high, as forward Kent Bazemore tied his career high with eight dimes. He was more impressed by Collins. “The future is very bright for John,” Bazemore said of the second-year forward from Wake Forest who has scored 19, 24, 26 and 30 points in the past four games. Nuggets: Return home to play the Grizzlies Monday. Hawks: Wednesday at the Mavericks, whom Atlanta beat 111-104 on Oct. 24.